ROBERT FALCON SCOTT Autograph SIGNATURE. 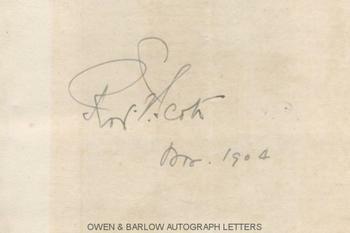 Autograph signature on paper piece, dated in his hand Nov. 1904. The paper piece measures approx 5.5 x 4 inches. It is tipped onto an album leaf with a contemporary newscutting relating to the expedition by the 'Terra Nova' for the relief of the 'Discovery' in 1904 when Scott's ship had been trapped by ice in McMurdo Bay. Central crease where originally folded and slight browning from offsetting, else fine. From the album of a Ms. Knowles, who was a charitable fund-raiser and the wife of a prominent clergyman in Gravesend, Kent. The majority of the autographs in her album are of visiting dignitaries to Gravesend and its environs. Robert Falcon Scott had returned to Britain from the 'Discovery' expedition in September 1904, whereupon he was feted as a popular hero and made a number of public appearances and speaking engagements. 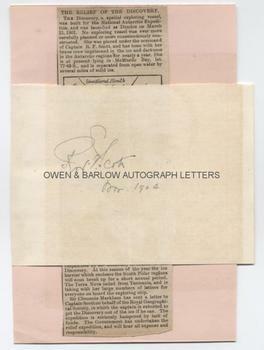 We are unable to establish whether he made such an appearance at Gravesend but, if he did, this was doubtless the occasion on which Ms. Knowles obtained the autograph.